The Cleito Pro was recently launched with the Puxos kit but due to popular demand the stand alone tank has been released – with a slight difference. The Cleito Pro ships with a different grade of material to further protect the tube from heat and potential cracking which in turn improves performance. 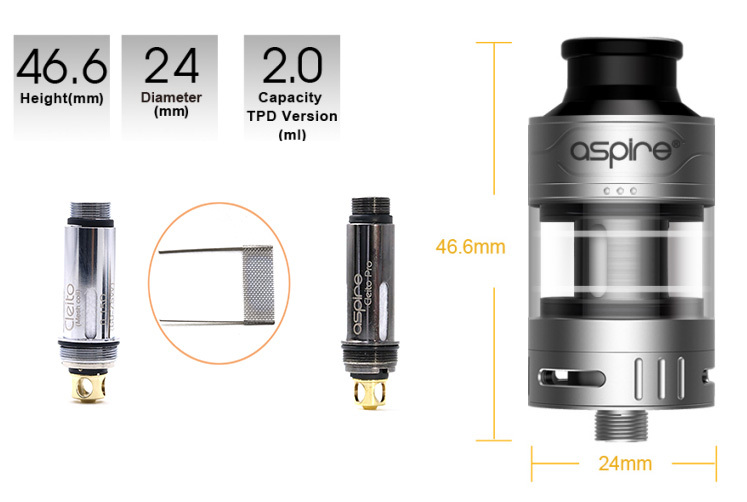 In addition to the improvements mentioned above the Tank also features Aspires stunning new Mesh coil. Rated at 0.15ohm and is designed to deliver ultra flavour and stunning cloud production. The tank also has the 0.5 Cleito Pro coil with improved wicking, intense flavour and all the vapor production you could want from a tank. Filling the device is so simple and easy with the new side filling port. Keep the 3 dots marking the fill port facing upwards, remove the sleeve, insert your bottle and fill. Then simply slide the sleeve back down and let the juice soak into the coil for 5 – 10 minutes. x1 0.15ohm Aspire Cleito Mesh Coil. x1 0.5ohm Aspire Cleito Pro Coil.